UPDATE: We regret to inform you that G’Day Casino is no longer open to Australian players. We recommend visiting our real money casino page for a complete listing of Aussie-friendly online casinos, bonuses, number of pokies, and more. G’Day Casino is a premium ‘play for real money‘ online casino website that was launched in 2013; they offer some of the best casino bonuses around. The casino is primarily directed towards the Australian iGaming market and can be contacted on +442035980281. It offers a wide variety of online casino games that can engage players for hours along with some attractive promotional rewards and impressive giveaway offers. It also offers huge welcome bonuses to attract new and enthusiastic gamblers. With an entirely instant-play concept and loads of games to choose from, G’Day is one of the most favoured online casinos ever. Welcome bonus: GDay offers its users 100 percent bonus on any amount of cash deposited on sign-up, meaning that the Casino will double your first deposit, irrespective of the amount. 50 free spins : As part of Gday’s offer, players get 50 free spins on the New NetEnt slot, When Pigs Fly. Free Beer: If players register with more than AU$100 while registering on the site, GDay Casino happily offers them free beer. For online gambling fans who love beer, it doesn’t get any better. 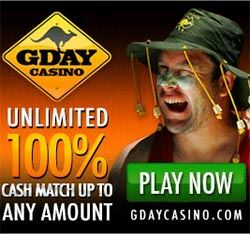 10 percent ongoing cash bonus: All new and experienced Australian players on GDay receive a 10 percent cash bonus of up to AU$50 on every deposit. Facebook lucky draw: Every Wednesday, G’Day selects a lucky winner on its Facebook page. Registered users who have also liked the Casinos Facebook page can get lucky anytime and win AU$50 cash bonus. Other weekly promotions: G’Day also offers much play for real money weekly promotional offers depending on the day of the week. Offers like ‘Break the Bank Wednesday’, ‘Monday Blues Buster’ and ‘Dish of the Day’ provide some great bonus opportunities for new and experienced players alike. Based on players’ preferences, GDay Casino provides multilingual customer service to all its users. Live chat can easily be initiated by players directly from the site’s home page. Players can also contact support by sending an email at support@gdayCasino.com. Support is also provided over the phone and users can dial +442035980281 between 9 am to midnight for help. G’Day also provides extensively crafted web pages explaining different game rules. The FAQ page can also serve a great deal for Aussie players who just need a little guidance. Payments made on G’Day Casino are handled by the Financial Services Authority (UK) registered payment processor ‘eMerchantPay’. G’Day claims to have implemented the best and the safest policies for their players to deposit money. The website is protected by a P128-bit SLL digital encryption, which keeps your transaction details safe. With such solid security measures in action, GDay Casino makes sure that even with fun in mind; security of their Australian players is taken seriously. One of the biggest positives of GDay is the out-and-out variety of games that it has on offer. You will find numerous amazing games from many top-notch developers like Leander Games, Betsoft Gaming and NYX Interactive. With over 240 different titles to pick from and the ability to play them instantly for real money without any additional software, GDay allows you play every game for free in the demo mode. Pokies: Robot Revolt, Aliens, South Park, Beowulf and Arabian Nights. Roulette: Common Draw Roulette, French Roulette and European Roulette. Blackjack/21: Super 7s, Single Deck BJ and Double Exposure. Other table games: Casino Hold’em, Oasis Poker, 3D Video Poker and Baccarat. 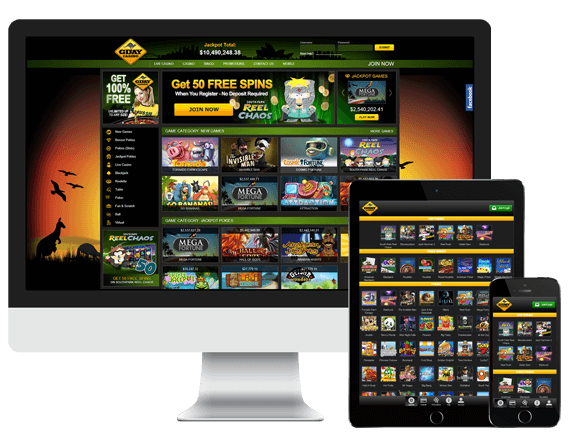 All of the G’Day Casino games can be played instantly on the web browser using Flash without downloading any software or application on your computer or device. It saves you from the trouble of worrying about your hardware’s compatibility, operating system or even device. Online casino games on GDay are powered by White Hat Gaming. The software provider ensures that the website lets players enjoy the best of casino games online in a safe and protected environment. It maintains game-play stability and monitors graphic designs as well. With exceptionally good graphics and audio quality, White Hat Gaming provides nothing less than a truly satisfying gaming experience. The interface of the GDay Online Casino is amazingly simple and stands out for its easy navigation. Games are neatly categorized on the left side while other important links can be directly reached from the top of the landing page. 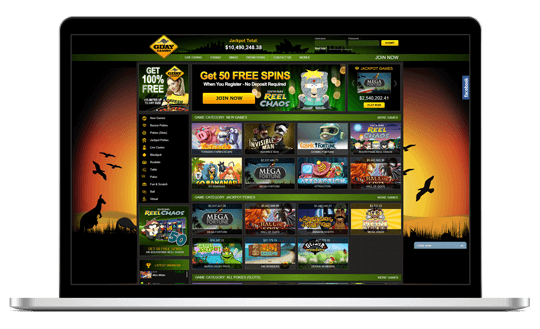 The website also keeps its players informed about the total jackpot amount right through the home page. Furthermore, if you are one who enjoys gambling n the go, you can make use of the GDay Mobile Casino. All in all, playing on GDay Casino is likely to offer you a great day! Due to the contact centre not being 24 hours, we will have to award the casino a 4 out 5.